I am sure you are wondering how many egg whites were thrown away last weekend to prepare the massive amount of french buttercream for the wedding cake / cupcakes not to mention the chocolate custard and other such egg yolky components. The answer is none. They were all placed in freezer bags. Sometimes we like to pretend to be healthy and have egg white omelets (bacon, cheese, and egg whites mind you) but mostly I like to use these egg whites for desserts. Meringues, pavlova shells, certain fluffy cupcakes… but today we will consult Thomas Keller for his chapter on Macarons in Bouchon Bakery . I have eaten these iconic macarons in NYC and Napa Valley. They are insanely delicious and can be made in a variety of eye catching colors. I am having thoughts of red, white and blue macarons for the 4th of July. 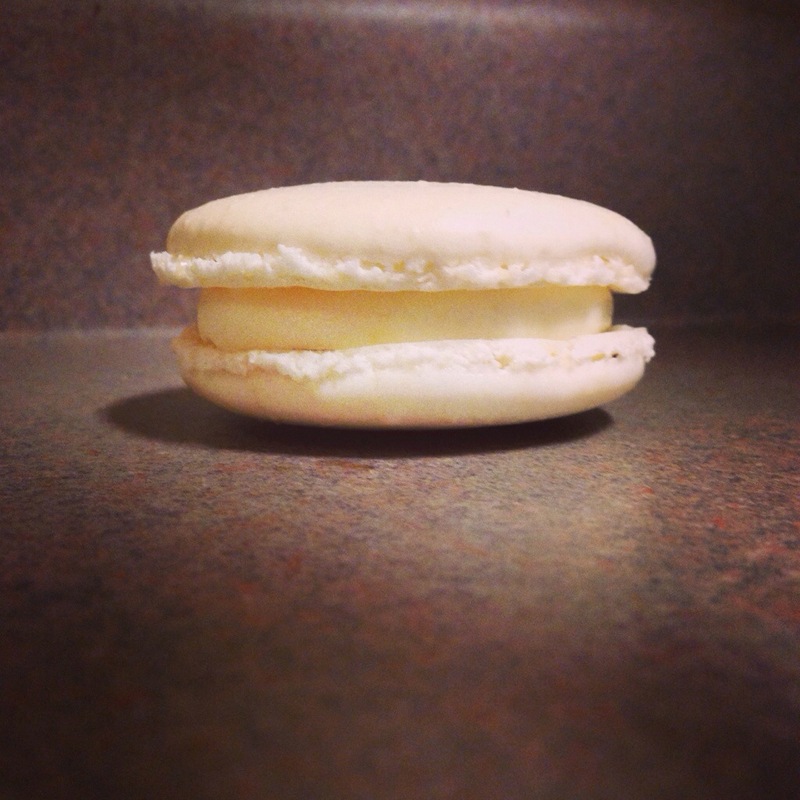 The tricky thing about macarons is the batter consistency. It must be thin enough to smooth out the tops of the cookies but thick enough to hold its shape. If you have questions about beating egg whites and are unsure what soft vs stiff peaks are, here is a nice video. This is the reason why you absolutely need to use a kitchen scale, it is the most accurate way to measure the ingredients for this delicate batter. There are actually two methods to make macarons, there is an amazing diagram here comparing the Italian and French techniques. I encourage you to take a look at this before following the recipe below. You will need almond flour for this recipe. It is a bit expensive but I have found it is the most reasonably priced at wal-mart. I like to use Bob’s Red Mill Flour Almond Meal but not all wal-mart locations will carry this, luckily it is available on amazon. You should invest in almond flour for your pantry, it truly changes the quality of tarts and other pastries. And when you decide to take the plunge and start baking from Thomas Keller’s Bouchon Bakery, you will def need the almond flour. You will not regret it! We are actually learning together today, I have never made macarons. But I just did it and they are fabulous! I filled mine with leftover lemon mascarpone buttercream but I have some seedless raspberry jam as well. There are some great combinations and recipes in Bouchon Bakery for lemon buttercream and lemon curd, also raspberry filling. I am definitely planning on making the raspberry macarons sometime soon but for now, just use whatever you have on hand like I did today! 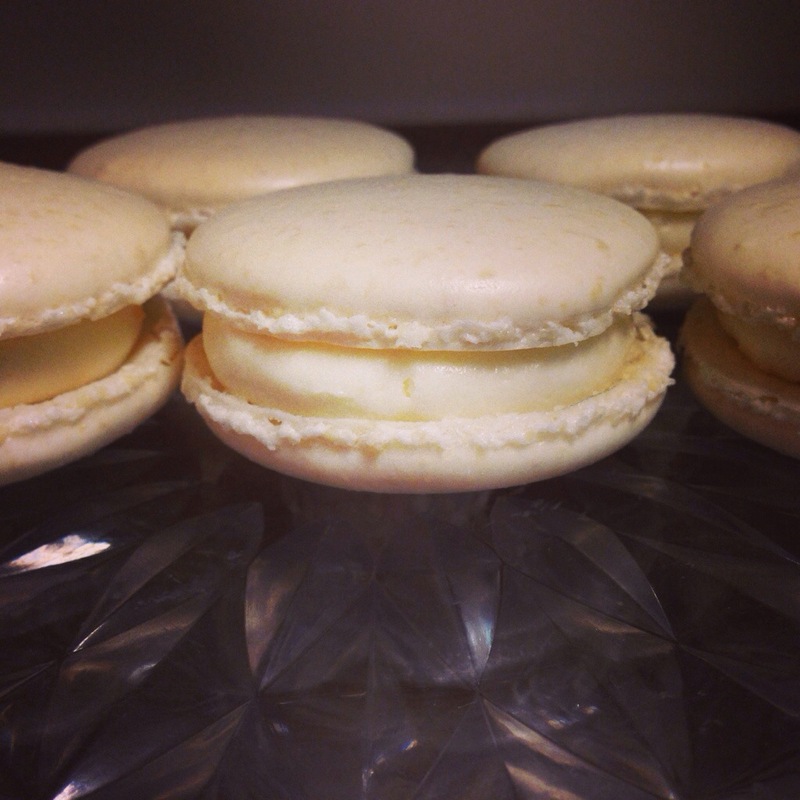 Fill your macarons with some tasty jam or buttercream you have stored in the freezer. If you don’t have egg whites in the freezer and you are wondering what to do with those yolks, please I beg you, make the Robicelli’s Buttercream. Preheat the oven to 350 degrees. 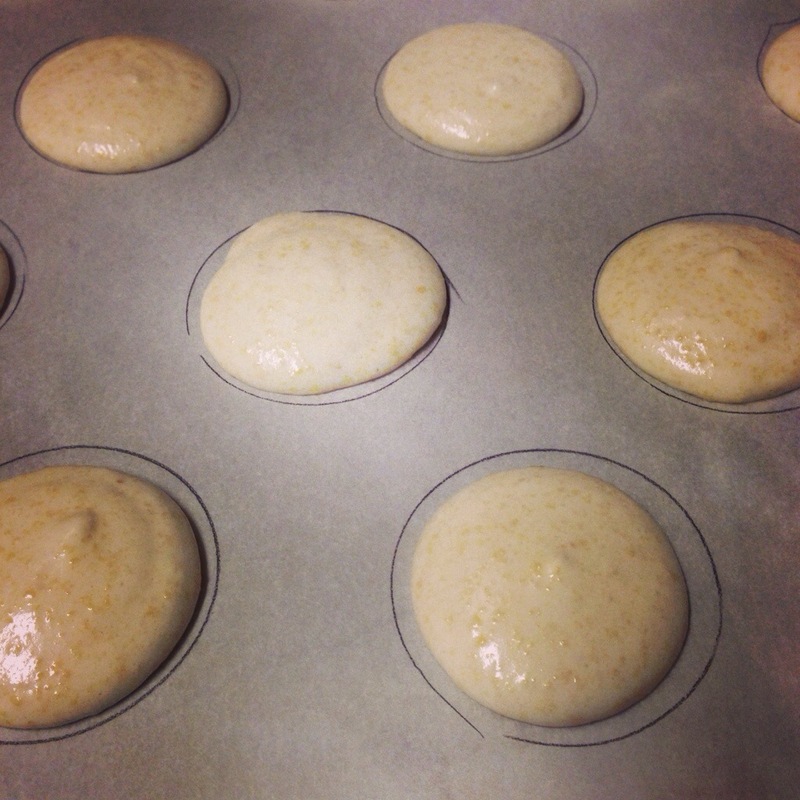 Line baking sheets with parchment and trace two inch circles, leaving one inch of space between. In a large bowl combine the almond meal and confectioner’s sugar, whisking to break up any large clumps. Pour the 82 grams of egg whites into this bowl and mix them in with a spatula. In a small saucepan, combine the sugar and water, cook over medium-high heat with a candy thermometer in place (or be very careful and use a thermapen, frequently checking the temperature). Place the 90 grams of egg whites in the bowl of a stand mixer fitted with the whisk. When the temperature is around 200 degrees, add a pinch of sugar to the egg whites in your mixer and whip on medium speed. Whip until they form soft peaks. If you see soft peaks before the syrup reaches 248 degrees, turn the mixer down to low and keep them moving. Prepare to move quickly when the syrup reaches the target temperature. When the syrup reaches 248 degrees, remove from the heat and increase the mixer speed to medium. Pour the syrup down the side of the bowl in a slow and steady drizzle until it is all mixed in. Increase the speed to medium-high and whip the meringue until stiff peaks form, it will look very glossy (kind of like when you make buttercream). Add in any coloring at this point, use gel color if at all possible. Take one third of the meringue and fold it gently into the almond flour mixture with a spatula. Gently fold in the rest of the meringue in small amounts. The batter will be very smooth so that after piping the surface texture with smooth away. Transfer the batter to a pastry bag fitted with a plan half inch tip. 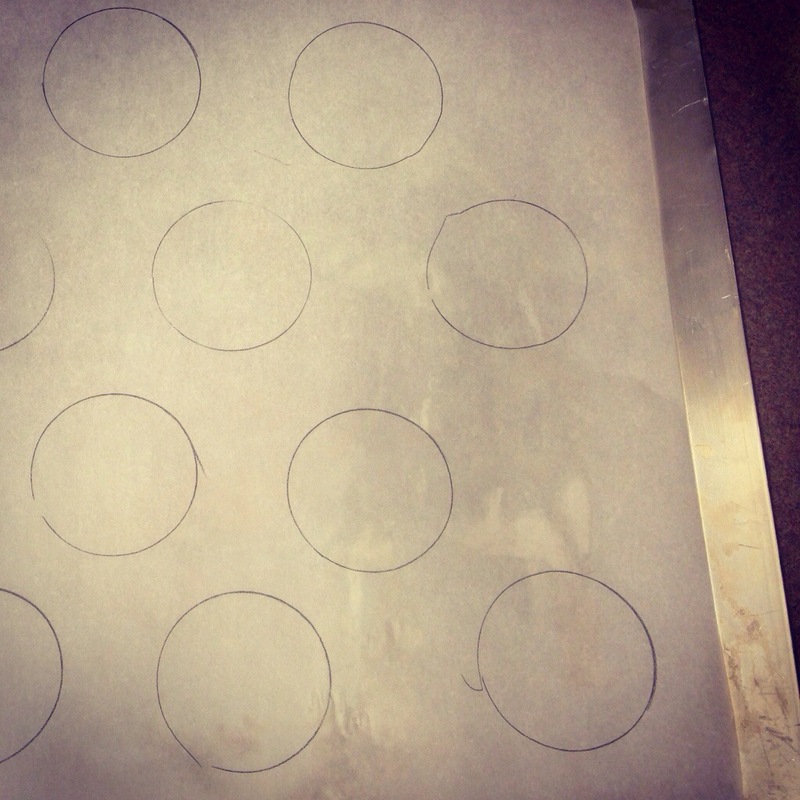 Hold the bag perpendicular to the prepared baking sheets and pipe the batter into the traced circles. Place the baking sheet into the oven and decrease the heat to 325 degrees. 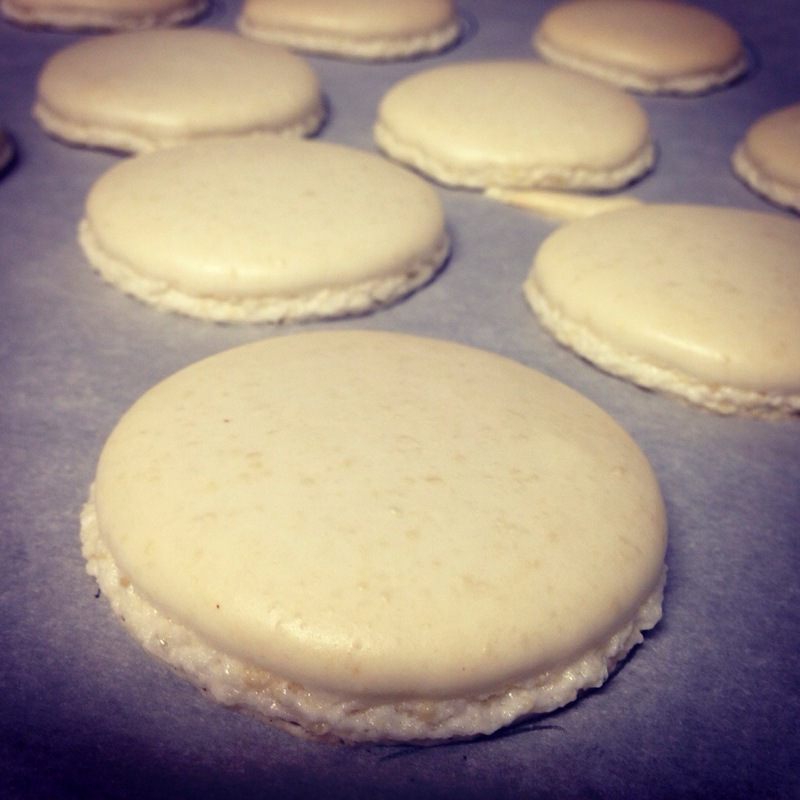 Bake for approximately 10 minutes until the tops are smooth and set and the macarons have feet underneath them. Allow them to cool for 5 minutes on the baking sheet and then transfer to a cooling rack. Repeat the last two steps until all the batter is baked. Bring the oven temp back to 350 degrees before you continue baking the rest of the cookies. Store them in an airtight container, they may even taste better tomorrow after sitting overnight. Match the cookies up by size and pipe your filling with a plain tip (or just place the filling in a ziploc and snip off then end). Recipe adapted from Bouchon Bakery .